Another view of ‘Satan’s Throne’? « Possible USA-EU trade deal: A prelude to the end? Yesterday, my wife Joyce and I were able to once again see and visit what could be ‘Satan’s throne’ if the devil does in fact have a physical throne on the earth. Back in 1987 on a tour of Saint Peter’s Basilica in Vatican City, those of on that tour (all WCG members) were told by a Worldwide Church of God minister who was conducting the tour that Joseph Tkach, Sr. (who was then the Pastor General of WCG–he died in 1995) stated that he felt that this was “Satan’s throne.” The WCG tour guide minister also said that that there was a tradition/legend (which possibly can be tied to one interpretation of the 12th century Malachy prophecy) that the final pope would sit on this throne. In 1776 there was excavated on the Aventine, near the present church of Santa Prisca, a chapel with frescoes of the fourth century; in these frescoes pictures of the two Apostles were still recognizable. Among the rubbish was also found a gilded glass with the figures of Peter and Paul. The feast of the dedication of this church (an important point) still falls on the same day as the above-described cathedra feast of 22 February; this church, therefore, continued to celebrate the traditional feast even after the destruction of the object from which it sprang. How Pope Damasus might be led to transfer the cathedra Petri from Santa Prisca to the Vatican, can be readily understood from the circumstances of that time. From the reign of the first Constantine the Lateran had been the residence of the popes, and its magnificent basilica their cathedral, while the neighbouring baptistery of Constantine served for the solemn administration of baptism on the eve of Easter. In the half-century from 312 to 366 (date of the accession of Damasus), the importance of Santa Prisca, its baptistery, and its cathedra must naturally have declined. Damasus could therefore be certain of the approval of all Rome when he transferred the venerable Apostolic relic from the small chapel in Santa Prisca to his own new baptistery in the Vatican, where it certainly remained to the first quarter of the sixth century, after which it was kept in different chapels of the Vatican Basilica…We conclude, therefore, that there is no reason for doubting the genuineness of the relic preserved at the Vatican, and known as the Cathedra Petri. It should be stated that it is by tradition, as opposed to historical fact, that Peter was actually ever in Rome and there is no evidence that he conducted any church service in Rome on a chair. The admission that at least one of the Roman chairs must have been destroyed and others may have come from elsewhere should help persuade those interested in the truth that the Cathedra Petri is not really Peter’s “throne,” or a place from whence he “ruled” all Christendom. While a Pope (Damascus) apparently believed he was transferring a seat/chair of Peter to the Vatican, that does not make it so (and even if there actually was a seat the Peter once sat on that is now in St. Peter’s Basilica, proves nothing other than a seat Peter sat on still exists). The throne that is now built over Cathedra Petri provides no actual proof that it was some place that Peter actually sat upon. The “no reason to doubt” conclusion in The Catholic Encyclopedia should be understood to mean “no real proof,” despite claims otherwise. Other sources claim that part of the reason for the legend of Cathedra Petri, as well as why there were multiple “seats/chairs/thrones,” was essentially that in the late second and third centuries that competing power blocks made the stories up to attempt to gain dominance (e.g. Sabatier A. Religions of authority and the religion of the spirit. Volume 16 of Theological translation library, 2nd edition. Translated by Louise Seymour Houghton. McClure, Phillips & Co., 1904. Original from the New York Public Library, Digitized Feb 9, 2011, p. 112). It has also been asserted that the seat underneath could never have been Peter’s as it came from the 8th century or simply the 17th century (Greatest Forgery in History: Chair of Saint Peter. Copyright © One-Evil.org 2011. http://one-evil.org/acts_forgery/forgery_chair_of_st_peter.htm viewed 07/22/12). 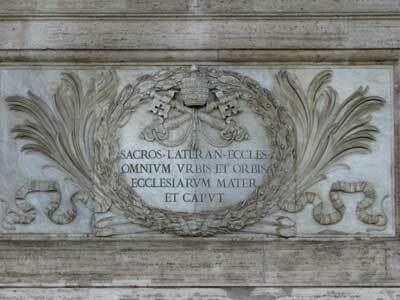 The inscription from Latin above translated into English means, “Sacred Lateran Church Mother and Head of All Churches of the City and the World” (cf. Revelation 17:5). Anyway, some believe that the final pope on the Catholic Bishop Malachy’s list, Peter the Roman, will sit on the Cathedra Petri (some consider that he will be an antipope, and thus a henchman for Satan) in St. Peter’s Basilica. And for those unfamiliar with Malachy’s list, he in the 12th century, predicted, with what some believe is complete accuracy, every pope since 1143. When Malachy’s list became public in the 16th century, it was considered to have been so accurate in predicting the 12th – 16th century pontiffs, that some thought it that it had not been written until the 16th century. In 1139…St. Malachy gave his manuscript to Innocent II to console him in the midst of his tribulations, and that the document remained unknown in the Roman Archives until its discovery in 1590…These short prophetical announcements, in number 112, indicate some noticeable trait of all future popes from Celestine II, who was elected in the year 1143, until the end of the world. They are enunciated under mystical titles. Those who have undertaken to interpret and explain these symbolical prophecies have succeeded in discovering some trait, allusion, point, or similitude in their application to the individual popes, either as to their country, their name, their coat of arms or insignia, their birth-place, their talent or learning, the title of their cardinalate, the dignities which they held etc. There are many, around the world, who, thanks to this prophecy, are totally convinced that the next pope will indeed call himself ‘Peter’–most not considering or caring what the implications of this could be. For a start, given the Last Judgment implications, many respected Catholic sources have tried to point out, for quite a long time, that the pope talked about in motto 112 does not have to necessarily be the pope who follows the one described by motto 111; this 111th pope now being the current pope, Benedict XVI (#266). The justification for this “hedging’ is that the mottos were not numbered in de Wyon’s 1595 Lignum Vitae. The numbering, to facilitate manageability, came later. Consequently, it can be contented that the author of this prophecy, whoever it was, did not necessarily mean that the pope described in the last motto would come immediately after the one identified in the previous motto. Basically, the last, very long, atypical motto describes the last pope. This last pope may come to be at a much later time–with an indeterminate number of intervening popes between him and the one described by motto 111. Therefore, this last motto may not actually apply to the next pope, in which case, the expectation of ‘Petrus Romanus‘ becomes mute. The protodeacon announcing ‘Petrus Secundus‘ from the balcony of St. Peter’s would be worse than shouting ‘fire’ in a crowded theater. There would be mayhem in what is likely to be another jam-packed St. Peter’s Square. People would panic. There could be a stampede, people could get hurt. The authorities in Rome and the Italian government would be forced to take immediate action to quell the understandable alarm. It would be considered, quite rightly, a security threat! For the first time in over a century there could be troops, Italian, NATO or both, surrounding the Vatican. There would be no celebrations, The Urbi et Orbi blessing, if it was to take place, would be viewed with understandable askance. Now, I agree that the current pope (who could be the last pope and is the one following #111 on the Malachy list) may or may not chose the name Peter II or anything similar–but that does not mean that he could not fulfill that prophecy. It needs to be clear, whether the pope does or not pick that name, the final major pope will be a destructive antipope. Malachy’s list did not actually name pontiffs, but basically gave short descriptions. And while some have concluded that Petrus Romanus is a name, it could be a description. The description could signify that he is a pebble (or “rocky” which is what the term petrus signifies) supporting the final Roman empire. So, perhaps the above photos do show at least one of Satan’s physical thrones on earth. Smith’s Bible Dictionary notes, “It is called “Satan’s seat” by John, which some suppose to refer to the worship of Æsculpius, from the serpent being his characteristic emblem. Others refer it to the persecution of Christians which was the work of Satan” (p.500). And that particular throne/seat, presuming it involved a physical one, probably was not the same physical one as the one shown above. The main period of the Pergamos Church era was from 450-1050. Just as the initial local Church at Pergamos (time of the Apostle John) was situated in a city where Satan swayed human politics, much of this work of God’s church during 450-1010 A.D. occurred within the bounds of the government of Satan’s Eastern Roman Empire. Yet, whether it physically is or not, in a spiritual sense it seems to be the same throne. The first is that the old Roman Empire had two divisions, the West (based out of Rome) and the East (based out of Constantinople/Byzantium). While in the West, the “fall of Rome” is taught in history, the fact that the eastern leg of the empire lasted nearly a thousand years longer is relatively unknown–and it existed before and after the entire time that the Pergamos era predominated. Furthermore, prophetic writers, including Catholic ones, have tended to consider that the two legs of the image of the Beast in Daniel 2 have to do with the division of the old Roman Empire. And while the old Roman Empire is no more, there still is a difference between the West (which tends to be Roman Catholic, with Protestant daughters) and the East (which tends to be more Eastern Orthodox). But historically (the “great schism of 1054 not-with-standing) they have supported the same goals, the same body, the same throne. So, from the above we see that the harlot woman reigns and has a history of persecuting the saints. This is the same woman/city that sits on the seven hills and reigns (both Rome and Constantinople are known for having seven hills/mountains). 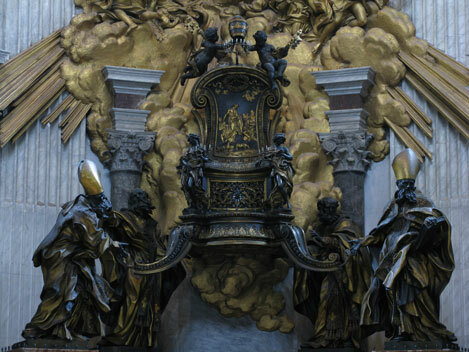 And the throne known as the Cathedra Petri is considered to be a throne of importance to at least Rome. Ambrose: He was a major factor in promoting and getting Athanasius’s view of the Holy Spirit adopted. He and the other four also heavily pushed celibacy. The trinitarian view that he helped get adopted by the Council of Constantinople in 381 that resulted in Church of God persecution at that time and since. He is also known for his work on Catholic “sacraments” (see Duties of Elders/Pastors). John Chrysostom: He was a big advocate of Greco-Roman religious holidays and, in 387, a big condemner of God’s holy days as observed by the Church of God (see Did Early Christians Observe the Fall Holy Days? and What Does the Catholic Church Teach About Christmas and the Holy Days?). His views have been cited throughout history and likely will be against the faithful in the Church of God in the end. Augustine: Mainly in the fifth century, he used the writings of Ambrose to expand upon sacraments. While he was not the first to turn against teaching the biblical doctrine of the millennium, he has been one of its main “intellectual” discounters that the Greco-Roman churches have relied on. Since the millennial teaching is the only doctrine listed in the current Catechism of the Catholic Church (Catechism of the Catholic Church. Imprimatur Potest +Joseph Cardinal Ratzinger. Doubleday, NY 1995, p. 194), it is likely that Satan’s supporters will use his writings against those of us in the true Church of God that will continue to teach this (more on the millennium can be found in the article Did The Early Church Teach Millenarianism? ). So the foundation, holding up the so-called Cathedra Petri is based upon Greco-Roman leaders who often took strong intellectual positions against the Church of God. This is another reason that, spiritually at least, it seems to represent Satan’s throne. Biblical, Catholic, and Eastern Orthodox prophecy suggests that the Roman and Eastern Orthodox Catholics will unify. They will strongly support (for a time) leaders that Satan inspires (cf. Revelation 16:13-14). False leaders likely to have complete access to Saint Peter’s Basilica and the so-called Cathedra Petri, and who for a while, will advocate the positions of the foundational doctors of the throne. If this Cathedra Petri is moved to area of the Church of God in Jerusalem’s Western Wall (commonly called the Cenacle), it is possible that it could fulfill some of the above prophecies. We will see. In the end times, it is possible that Satan or one of his demonically-inspired representatives (cf. Revelation 16:12-13) may literally sit upon the black throne shown above. And while it may or may not literally be the throne of Satan, the basis the so-called Cathedra Petri and its anti-Church of God foundation suggests why it spiritually seems to at least partially represent Satan’s throne. Europa, the Beast, and Revelation Where did Europe get its name? What might Europe have to do with the Book of Revelation? What about “the Beast”? Who is the king of the North? Who is the Man of Sin of 2 Thessalonians 2? Is this the King of the North, the ten-horned beast of Revelation 13:1-11, or the two-horned Beast of Revelation 13:12-16? Some rely on traditions, but what does the Bible teach? Here is a related link in Spanish/español: ¿Quién es el Hombre de Pecado de 2 Tesalonicenses 2? Here is a link to a related YouTube video, in English, titled Who is the Man of Sin? Apostolic Succession What really happened? Did structure and beliefs change? Are many of the widely-held current understandings of this even possible? Joyce’s Photos of Pergamos Pergamos (also known as Pergamum, but currently known as Bergama, Bergamo, or Bergamum) was one of the seven churches of Revelation. Joyce’s Photos of Rome, St. John’s Basilica, and the Vatican Rome has been a major world city for centuries. Since the late second century, it has made claims of prominence over Christianity. There are also two views of the Cathedra Petri shown. This entry was posted on Wednesday, June 19th, 2013 at 12:01 am	and is filed under Church History, Prophecy, WCG News. Could the ‘Cathedra Petri’ be ‘Satan’s throne’? Have you seen ‘Satan’s Throne’? Could the ‘Cathedra Petri’ be Satan’s Throne? Might Satan’s throne be the ‘Cathedra Petri’?